The quest to find the perfect bridal gown should be happy, stress-free and—most importantly—fun. 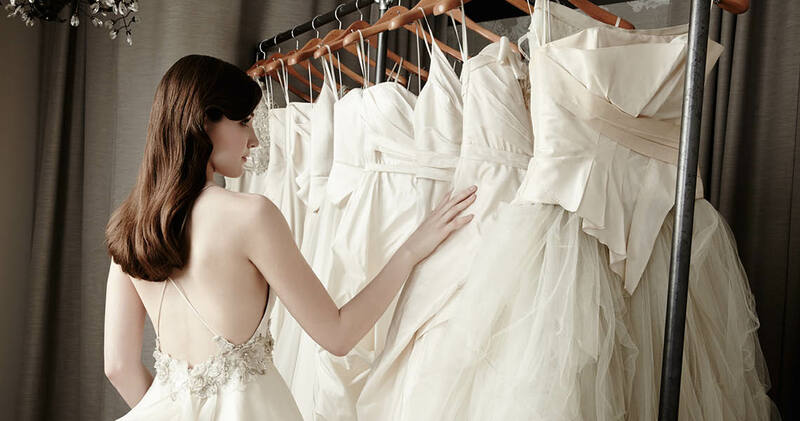 However, many brides get nervous during the first round of wedding gown fittings. Sometimes they just don’t know what to expect from the experience, but often it’s because they don’t know if they can trust the sales assistant to put them in a gown that will actually suit them the best. To compensate, brides put their trust in their friends and family, which turns the personal experience of wedding gown shopping into a tiring group effort. Then, what begins as a day filled with excitement becomes one quickly engulfed by frustration and annoyance, as you, the bride, stand overwhelmed by all of the opinions! Your mom isn’t quite sure about the dress you have on, as she’d prefer you in a super-traditional gown that everybody is wearing. Your sister hates it. Your friend thinks it should be poofier.You’re looking for simple, sophisticated, and flattering elegance, but your aunt thinks you should have a train and a huge veil. So, who has the answer? You do! Trust your gut instinct. It is not unusual for the bridal party to be opinionated, but never underestimate your own opinion. It’s the most important one. You know what feels right. After all, you are looking for the gown that will best fit your personality, your body, and the wedding venue. No one knows you better than you do, so if you don’t feel right in a gown it probably isn’t the one. This test should stand true throughout your wedding planning experience. It’s okay not to know exactly what you are looking for, which is why you should see and try on a variety of designs. That said, knowing what kind of wedding (venue, budget, and theme) you are leaning towards will help you to narrow down your favorite choices! This is your dress! Speak up and express your opinion, as this will help the process. Don’t allow anyone to make you feel pressured or constricted for time. You should have a chance to meditate on the dresses you liked the best and the opportunity to visit the bridal boutique for a second time, if you’re not quite sold on your dream gown yet. Weddings are a family celebration, and create a proud family moment, so family approval is obviously very important…but this is your wedding, and the event should reflect your own personality. Your family has your best interests in mind, and they will respect your decisions! Now pop the champagne bottle and enjoy!